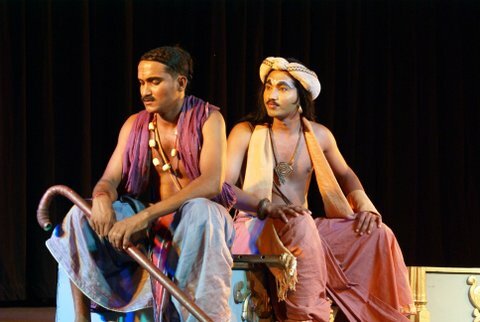 “Kaliman Vandi and History of Sri Lankan Tamil Theatre” was the title given to the write up by Sivagnanam Jeyasankar of the Eastern University , on the Tamil adaptation of the Sankskrit drama “Mruchakateeham” assumed to be written by Chudrakha between 400 – 500 AD. This was produced in Tamil with the participation of the students of Swami Vipulananda Institute of Aesthetic Studies of the Eastern University , Baticaloa. Young Rasaiya Lohanathan, a Janakaraliya dramatist, developed the Tamil script that was accepted as worthy of production by Prof Maunaguru, who was its Executive Director, while I assisted in the production as the Director of the Sinhala version of the same drama with the “Janakaraliya” mobile drama group. 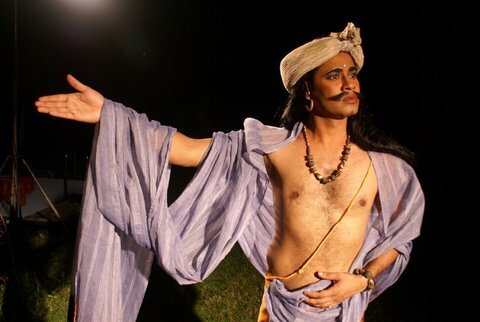 For those who are not very familiar with the “Janakaraliya” mobile theatre group, let me first make this “one line” introduction. It is a multi ethnic, multi cultural group of youth from different districts in Sri Lanka , who, for over 09 years have been studying and producing drama in both Sinhala and Tamil, while performing in all districts in Sri Lanka for Sinhala, Tamil and Muslim audiences. Getting back to Jeyasankar’s write up, I think the first that needs to be said is, all what he notes as from the leaflet distributed at the first performance of the play in Batticoloa, are total fabrications and distortions. There were no such mention of what he uses as “quotes” in that leaflet and it does not fit an academic to stoop that low, in trying to fix his own argument. I would therefore not comment any more on that. That said; let me now answer the few main issues he has raised in his write up, posted in DBS’s blog. First the language in translation. I am no authority to contest Jeyasankar’s claim that the translation into Tamil itself is of very poor quality. I was nevertheless cross checking the translation with two others, while Lohanathan was at it, to see it remained true to the original version, “as a script”. What I could vouch for, without any hesitation and doubt is that Prof Maunaguru’s knowledge of the Tamil language, accepts the Tamil script as very good, unless Jeyasankar discards Prof Maunaguru’s Tamil language proficiency. Even if he does, the Tamil audience and the university staff in Pondicherry , Tamil Nadu, had no problems with the Tamil language of other translated plays of Janakaraliya, also done by Lohanathan, which goes to prove that Lohanathan by himself is a good translator. 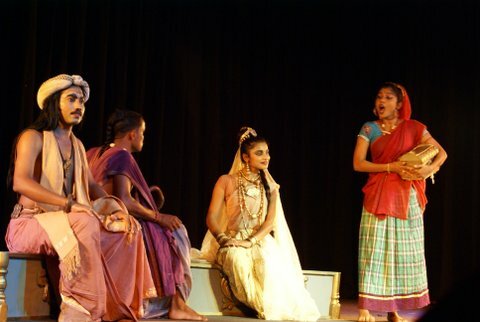 The rest is left to all the Tamil people who came to see the play, “Mruchakateeham”, not only in Batticoloa, but also at the Lionel Wendt, Colombo and never complained about its Tamil dialogue. And in passing, let me also note here, the stubborn insistence of Jeyasankar all through his write up to call the play, “Kaliman Vandi” when it was introduced in all leaflets and in public forums as “Mruchakateeham”, proves he is nourishing a selfish resentment, which he cannot publicly express. Before I come to the most important issue of modern theatre and the “Sri Lankan Tamil Theatre”, let me also ask Jeyasankar, what brand of “feminism” he is talking of, when he accuses this play “Mruchakateeham” had been adopted without gender sensitivity and feminist perspectives. Unfortunately for Jeyasankar, his gender sensitivity and feminist perspective does not go beyond a well knit, patriarchaly disciplined family where “beating the wife” at home is not the norm. 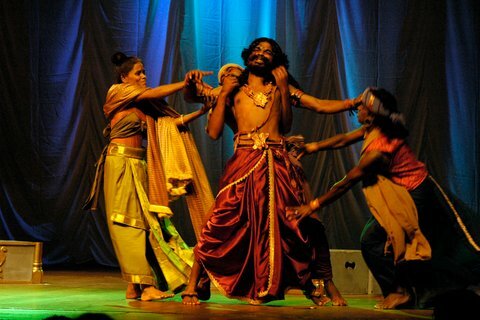 Jeyasankar therefore goes on to say, “Most cases of domestic violence and violence against women are related to the theme of the play ‘Kaliman Vandi’ (Mettikaraththaya).” For Jeyasankar, Charudhatta’s relationship with Vasanathasena is an unacceptable “extra marital” relationship that should lead to domestic violence. Therefore he poses the question, “What would have happened if Charudhatha’s wife reacted to the suggestion negatively and said NO?” Jeyasankar is well within the puritanical “Victorian” concept of marriage, while Chudrakha, 1600 years ago, was discussing the “emancipated woman” who was able to develop another open, sisterly relationship within her marriage. It is this qualitatively higher human relationship within marriage that “Mruchakateeham” brings on stage, for dialogue. What Jeyasankar also fails to understand is that, even in the original Sanskrit play, “politics” is no main plot. The main plot is what we have dealt with around this triangular relationship. The “royalty”, what Jeyasankar perhaps reads as “politics” comes in only to create the added props to the “love and marriage” discourse. I would suggest he reads the original Sanskrit play, published in the book titled ‘Maniyal Siru Ther’ translated in the year 1933 by a veteran Tamil scholar named Mahamahopathyaya Pandithamani Kathiresachcheddiyar. For readers’ information, this book had been reviewed as an excellent literary work and the foreword to it was written by the prominent Sri Lankan Pundit, Swami Vipulananda. Finally about the history of Tamil drama, no one disputes that there were ancient traditions. What is disputed is Jeyasankar’s dogma that they have to be carried through without any cultural interchanges and sharing. His mutely voiced protest that “outsiders” who enter into the domain of Tamil drama, pollutes Tamil tradition is in fact an extremist, fundamentalist approach that would never allow Tamil drama to grow beyond what it is today. In fact Tamil drama did not grow into an aesthetic experience of visual performance in front of a “free and debating” audience. Tamil drama instead was turned into “agit – prop” skits for over 30 years that tried using old tradition as a medium propagating “Tamil nationalism” politically. No cultural and literary medium grows creatively in a politically suppressed society that allows only a straight jacketed ideology. There are efforts in poetry and prose literature that gives dissent a voice, in such politically moulded, dominating ideologies. Often theatre and drama finds it extremely difficult to give such dissent a stage, for very practical reasons. Often such dissent is culturally carried in Diasporic life and not within the society itself. For over 30 years, such was the plight of Tamil drama that had no space for growth within the Sri Lankan Tamil society. What Jeyasankar seems to represent is this undemocratic trend in Tamil culture and literature as history of Tamil drama. One that tries keeping Tamil drama chained to old traditions and applied for his political needs. Unfortunately, such application can exist, but would not allow Tamil drama to evolve into a new tradition of aesthetic experience that could transcend language and reach the world. What is nevertheless important is, Jeyasankar in his own limited way, has provided a platform for a much broader discourse that others could join. For that opportunity, I am thankful to Jeyasankar as a colleague. My, you’ve come a long way haven’t you???? 🙂 Or are you pretending to be a “moderate”? This is great that there has been soo much written about by three people on this website on Tamil drama. Yes – i agree we need to make tamil drama reflecting our realities at present- militarisation of Tamil society,war widows etc. But it is also true that the stale politics of tamil activism, academia and arts need to be reinvigprated too. This includes accepting our sanskritic past and present, negating colonial reading of caste as opposed to looking at jati being a tool for diversity of practices and reality in SOuth india and Sri lanka( jati opression is bad but is jati bad in itself? ), outgrown Darvidian politics, over simplifies understanding of feminisms etc. As the writer notes( about Victoria npuritanism) we seem to have accepted missonary scholarship as our own without any real reflection of ground realities. Also i want to see a considerd n thoughtful joy, love, and a passion for life in SL thatre. Now, that will be radical than lamenting all the time. I don’t want to get into the polemics of Jeya and Prakrama except to dispute the latter when he says,’In fact Tamil Drama did not grow into an aesthetic experience of visual performance in front of a “free and debating” audience’. 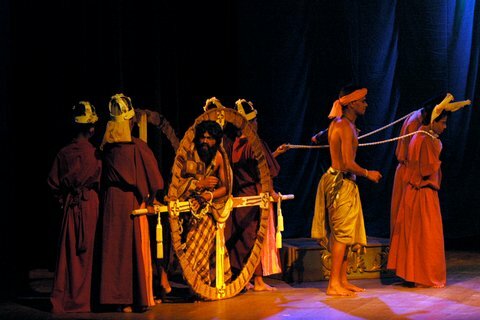 In fact ‘kodai’ and ‘Puthiyathoru Veedu'(Scripted by the famous Tamil poet Mahakavi(Rudramoorthy)-father of the currently famous Poet and Prof.Cheran- both plays produced by ‘Nadodikal’ Theatre and Literary group were aesthetically satisfying plays and ‘Kodai’ was staged(revived) after almost 25 years of its first performance even at the ‘Lionel Wendt’, not a traditional place for Tamil plays and at ‘Jayasinghe Hall’ in Dehiwela(both under my direction). Plays by Dr.Mownaguru (Sangaram) created lot of debate between many academics(like Prof.Shanmugaratnem)in both Tamil and even English media. 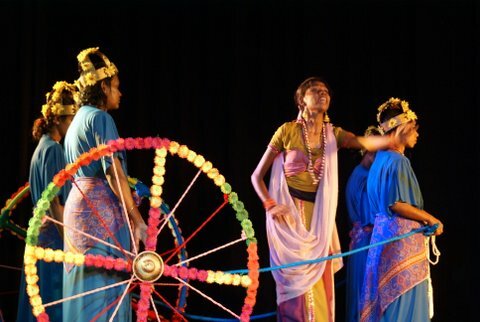 Further when ‘Trojan Women’ was staged at the Trincomalee Vivekananda College Auditorium in Sinhalese among a predominantly Tamil audience during the so called ‘Peace Time’ after the CFA was signed between the protoganists of the war,it was welcomed enthusiastically. My humble request is, please read the leaflet again and forward a scanned copy to Transcurrents.com too. It will give an opportunity for the people to think and decide the truth. I am also puzzled that the director of the play is not sure about the quality of the translation. If possible pl publish the translated script too. Its also interesting to note how veteran dramatists reflects life and art particularly theatre art of the last thirty years among the Tamils of Sri Lanka. (also see:Ceylon Today-2012-05-07 Professor Maunaguru; Icon of Indigenous Tamil Culture)These reflections shows the unwillingness or the lack of knowledge on Theatre activities in times of oppressions and suppression on and among the Tamils of Sri Lanka. 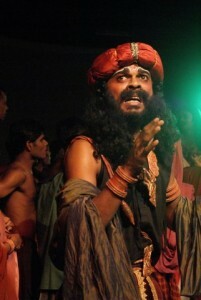 Please try to understand the real role played by the thespians of Tamil theatre in the last thirty to forty years. In my opinion it must be the pre-requisite for collaborative or integrative work. I will respond in detail for the responses made by Mr. Parakrama and Dr. Sunil in a single article because it seems similar and contribute each other. Branding the opponents as fundamentalist, traitors and terrorists is the last refuge of the politicians but not the trick of the artists and academics. Parakrama Niriella, It depends who this ‘outsiders’ entering and with what motive, when the minority culture in its vulnarable state.